Based on the Speech Plasma method, this book is designed to teach students to speak English in a natural, conversational manner. This book includes personal stories narrated by 17 people from different parts of the United Kingdom, the USA, Ireland, Canada, and Australia. The volume is supplied with audio files. Our intention in recording this range of voices was neither to collect as many accents as possible nor to find the most typical or strongest accents. Rather, our aim was to illustrate a range of regional pronunciation in English. By listening to the audio, the listener will hear the differences in the way native speakers communicate in English and get an idea of how the language is spoken in such diverse places as London, New York, Manchester, and many other parts of the English-speaking world. 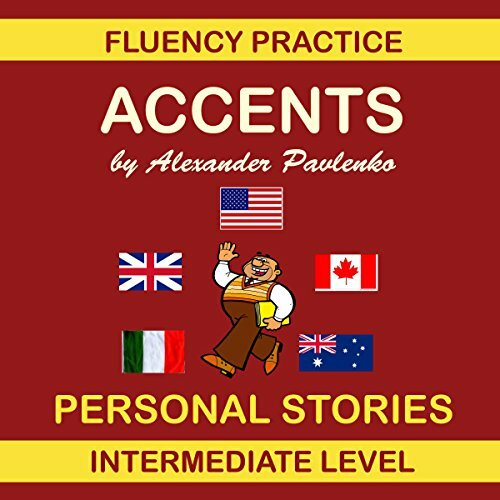 Accents, Personal Stories is part of the Fluency Practice series designed to expose students to English as spoken by native speakers in a range of situations. This book, however, differs from the others in the series in that while the stories the speakers tell were also recorded and transcribed, they were not edited in order to rid them of unnecessary repetition or other grammatical errors. This gives the stories the authentic flavor of English as it is spoken. Accents, Personal Stories can be used for listening and reading practice, for identifying regional accents and analyzing various informal types of speech. The book can also be used for teaching and learning how to present a personal story in a concise and interesting form.